It is imperative that arrival and dismissal times be closely adhered to. The time before class is vital for teacher preparation to ensure a smooth and productive day. Promptness in a child’s life is very important. Children who arrive late, or who are picked up late tend to feel uncomfortable. Tardiness can be very disruptive to the teachers and classes in session, and creates an awkward beginning for a child’s day. Children arriving at school on time have the opportunity to meet with friends and adjust their schedule before their work cycle begins. If a child arrives late to school adults do not need to further disrupt the class by entering the classroom, please say good-by to your child outside the classroom. Each child must be accompanied by an adult into the building. Children must be signed in and out of the school. Please be sure to sign your child’s attendance record for each day. This requirement is a state law and assures the School that your child is actually in attendance. California law requires the school to dismiss children only to those authorized to take the child from the school—parents or others on file with the school office. Any changes must be in writing. Every child picked up late will be charged a late fee of $1.00 per minute. It is payable to the staff member who is waiting with your child. 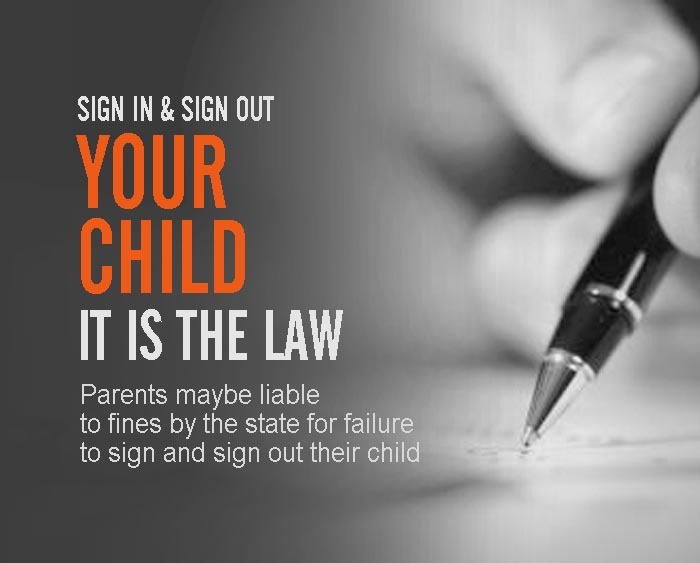 California law requires the school to dismiss children only to those authorized to take the child from the School—parents or others on file with the school office. Any changes must be in writing. The designated person must show valid identification (driver licence) prior to the release of the child.